With nearly 100 educational sessions and more than 700 exhibitors available to you, be sure to plan your days ahead of time to make the most of your ISSA experience. First up, download the free Show app (sponsored by Reliable Redistribution Resource) to put the entire ISSA Show lineup at your fingertips. Through the app, you can view the comprehensive schedule of events, access your personalized My Show Planner agenda, peruse the exhibitor listing, and receive real-time alerts of program updates through the convenience of your mobile device. Compatible with both Android and Apple devices, the app can be downloaded for free from issa.com/app. Prepare to be inspired by the latest technologies and innovation affecting the entire cleaning-industry supply chain. More than 700 leading companies are showcasing their latest products, services, and technical expertise in order to help you make your business more efficient and profitable. Be sure to set aside enough time to walk the entire floor to research new products, explore business partnerships, and get inspired to automate or boost your bottom line! A highlight of the show is the ISSA Innovation Marketplace and Lounge. More than 40 leading-edge products have been nominated for the prestigious ISSA Innovation of the Year. Check out these products on display in Booth 3405, open during exhibit hours. Then…drumroll please….make a point to stop by the Innovation Marketplace on Thursday, Nov. 1, at 1:00 pm for the announcement of the 2018 ISSA Innovation of the Year award winner! ISSA Show North America 2018 is proud to present two exceptional keynote presentations that will inspire and inform you. At 9:00 a.m. Wednesday, renowned success mentor Darren Hardy delivers “Igniting the Compound Effect: How to Jump Start Your Income, Your Life, and Your Success.” Learn the fundamental principles every achiever needs to know, practice, and master to obtain anything more than ordinary success. 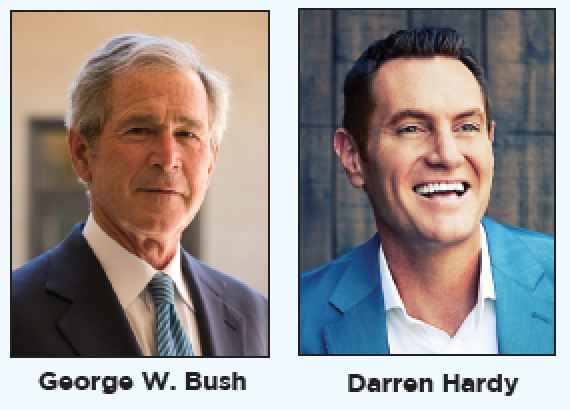 Then, on Thursday morning, enjoy unique access to an exclusive conversation between ISSA Executive Director John Barrett and George W. Bush, Texan and 43rd President of the United States. Discover the former President’s life lessons, leadership philosophy, and thoughts on how American can move toward more unity.